The term “grand cru” refers to a brewery’s finest product, and it is no different at Cantillon. After three years of fermentation the very best casks at the brewery museum are selected for the Grand Cru Bruocsella. This organic lambic is unblended, so it is essentially without carbonation and has a rich, mature flavor profile. Cantillon says this beer is intended to be “not drunk but savoured”. The Bruocsella is a lightly hazy golden poppy. Just a hint of activity puts a spindly thread of straw-colored head in a ring around the glass. The nose is quite funky and sour: horse blanket, vinegar, and sour laundry. There is a bit of peanut butter. The aroma is dry and dusty. Like many lambics it is woody, but taken to a new level: it reminds me of the smell of my recorder from elementary school. Notes of cheese and gym sock. Paired with all this pleasantness is a delicate fruit character of mango, papaya, and red delicious apple. A noticeable acidity leads the flavor charge, turning more potent as it moves back in the mouth. A sharp lactic tart is augmented by a bit of acetic sour. A funky, sweaty barnyard character rides the top of the tongue. Grains come out on the sides with wheat, pale malt, and some huskiness. A bit of a jelly bean fruit character. The flavor is rich, the sour pungent, and the carbonation nonexistent, but somehow this beer is still quite drinkable. Oh, I’m sorry Jean-Pierre, “savorable”. What a long, strange week it’s been. Among the most unique authentic fruit lambics is Oudbeitje. This strawberry lambic is brewed by Hanssens Artisanaal in Dworp, Belgium. Some of the oldest bottles I have tried taste wonderfully delicate and balanced with a subdued fruit flavor. This bottle (I got it at the Red Monk in Des Moines) was a bit more sharply sour. The Oudbeitje pours a brilliant salmon. It is usually not too carbonated but this bottle is quite still (loose cork?). There is no head, just a few bubbles around the glass. A pungent barnyard aroma dominates, with a hidden strawberry character and hints of bubble gum and cattiness. The taste is mouth-puckeringly sour. Very funky flavors come out: horse blanket and balsamic vinegar. There is also a definite strawberry taste. The sour fades into a long lingering tart. Modern beer is produced through fermentation by a pure culture of yeast. Brewing yeast is a strain of either Saccharomyces pastorianus (for lagers) or Saccharomyces cerevisiae (for ales), and its purity is constantly maintained. However this practice is only a few hundred years old, evolving alongside (and in a large part motivating) the study of microbiology. Before the invention of the microscope the various fermentation microbes were indistinguishable. The yeasts and bacteria would form a mixed culture referred to simply as “Godisgood”. This cake would be repitched from batch to batch indefinitely, a method much like making homemade sourdough bread. Brewing yeast (especially lager yeast) is prized because it ferments alcohol yet generates minimal byproducts. There are many other microorganisms (bacteria and wild yeasts) that do much the same work less cleanly. The vast majority of these are considered beer spoilers. With the right species under the right conditions, a mixed fermentation of bacteria and yeast will produce something with more depth than any wine. The addition of strains of bacteria to beer adds a unique flavor: sour. This comes from organic acids, predominantly lactic acid (yes, like sour milk) and acetic acid (yes, like vinegar). If not handled properly sour beer will be worse than vinegar or sour milk, a lesson understood by many beginning homebrewers (from pouring their beer down the drain). However, when made with style and grace a sour beer is simply divine. If you already appreciate the complexity found in the binary balance between malt and hops, imagine the possibilities afforded by the addition of this new dimension of flavor. Certainly sour beer takes dedication to appreciate. Doesn’t all beer? If you were to try Pliny the Elder or some other ridiculously hoppy, ultra-bitter beer, without previous experience with IPAs, that too would seem undrinkable. Given the proper introduction, however, it is not just drinkable but delicious. The most striking character of sour beer is its complexity. Certainly there is the strange balance between malt and acid and hops. Fruity character is accented by the acidity in the same way it is in a high quality wine (or an orange or grapefruit for that matter). But my favorite part of the complexity is the way the taste of a sour beer will change as it sits on your tongue. The organic acids will slowly neutralize after coming into contact with your mouth and saliva and different aspects of the beer will shine through at different times. There are basically three types of sour beer: the weissbiers of Berlin, the brown and red ales of east and west Flanders, and the lambics and gueuzes of the Zenne (Senne) valley. Blending is common if not the rule for all of these styles, both to temper and accentuate the sourness. Berliner weisse is a pale wheat style with a clean and crisp acidity that comes from lactic acid. It is usually brewed to 2.5 to 4 percent alcohol, making it a shankbier or “small beer”. Traditionally it is served with a sugar syrup that comes in two flavors: green is woodruff and red is raspberry. Flanders red-brown ales have a strong fruity malt character and a balancing acidity. Unlike Berliner weisse the red-browns have a prominent acetic component in addition to the lactic sourness. This is stronger in the red ales of west Flanders, which are aged in oak. The east Flanders brown ales are aged in steel and have more dark malt complexity that makes up for the relatively restrained acidity. Lambic is a style of beer that properly can be brewed only in spring and fall in the valley of the Zenne, a river that flows under downtown Brussels. This valley is home to a particular microbiocoenosis: the balance of various bacterias and wild yeasts is just right to produce the true champagne of beers. Lambic is fermented in wood casks, which produces two important effects. First, the microbiota can “hibernate” in the wood, something more and more important as the area around Brussels gets paved over. Second, all the carbon dioxide escapes through the wood, so unblended lambic is flat. Lambic is almost never consumed straight anyway. There are three common preparations. Faro is lambic that has had Belgian candi sugar added. Gueuze is a bottled blend of old (two or three year) and new (six month) lambics. The sugars remaining in the younger beer ferment into carbon dioxide producing a sparkling beverage. 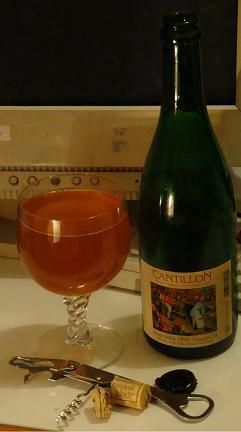 The most common lambic preparation is the addition of fruit. Raspberries and cherries are the traditional candidates, with Shaarbeekse cherries being the real classic (Shaarbeek, former home of endless fields of cherry trees, is only a kilometer from downtown Brussels). Sour beer must be savored with patience, but your dedication will be rewarded many times over with an intensity and depth beyond that of any other beverage. And that is why sour is my favorite kind of beer.